Luxurious villa Del Sueno, WiFi, internet, H/pool,Table Tennis, Pool table, A/C, Hot tub. The magnificent villa Del Sueno is ideally situated in the Canarian village of Tias in Lanzarote. Just a short walk from the villa is the village centre where you will find supermarkets, shops, good restaurants, tapas bars, local bakery and taxi rank. The spacious villa is tastefully decorated to a high standard and has 4 Large bedrooms with massive private terrace. 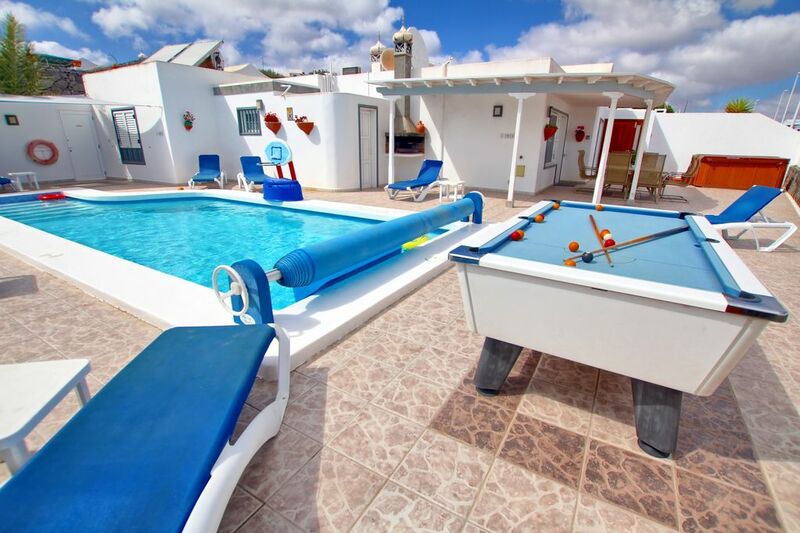 The full size pool is electrically heated whilst being surrounded by comfortable sun beds and barbecue area. An American pool table and Table Tennis for guests use. Air conditioning and keep you cool during those warm sultry nights. A large 7 seat hot tub jacuzzi is on the terrace for that soothing and relaxing soak and hydro air massage. Free WiFi wireless high speed internet hotspot is available throughout the villa and terrace. Stay in touch with friends and family whilst sipping that holiday cocktail. Car Hire: We can arrange competitively priced car hire during your holiday in Lanzarote with a local car hire company on the Island who offer the very latest models. Please ask for a quotation. Vehicles can be collected and returned to airport. Prices include unlimited mileage. Also up to 2 child seats are available at no charge. Villa Del Sueno. Lanzarote 'Isle of Dreams': Lanzarote, the sun-kissed & the most easterly of the 7 main Canary Islands is claimed to be the most exclusive. The climate is dominated by north eastern trade winds and the warm Gulf stream producing glorious summer temperatures all year round. The main resorts are concentrated in the centre and south of the island, Puerto del Carmen, Costa Teguise, and Playa Blanca. The most popular resort is Puerto Del Carmen with over 5 km of golden beaches, rocky divides and palm trees. Only a five minute drive away from the hustle and bustle of Puerto del Carmen, Villa Del Sueno can be found. Stress related conditions - Using a spa is the perfect antidote for stress. The warm water combined with a soothing massage helps relieve anxiety, chronic headaches and high blood pressure and also relaxes tense muscles due to stress. Sleep benefits - relaxing in hot water before bedtime can promote a natural and deeper sleep using the body's own chemistry. Diabetes benefits - It was written that sitting in a hot tub over a specific period of time improved the patients' diabetes condition as it lowers blood sugar levels and boosts general well being. Arthritis and pain relief - hydrotherapy is one of the more popular treatments for arthritis, athletic, joint and muscle pain relief. Four bathrooms, 3 en-suite and one with a jacuzzi bath, two come with his and hers marble wash basins and the third and forth are recently added unique wet rooms, 2 hair driers also supplied. There is also an outdoor shower by the swimming pool for cooling off during the HOT summers. Villa Del Sueno is 5 minutes to one golf course and 15 minutes to the other. 2 steps up to the villa entrance then the terrace and villa are all on 1 level. Villa Del Sueno has a Salt water pool. Water that’s gentler on skin, eyes, nose and hair. And there’s no unpleasant chlorine smell. The villa has 4 double bedrooms, four bathrooms, three en-suite and one with a jacuzzi bath, two come with his and hers marble wash basins and the third is a wet room, two hair driers also supplied. BBC1/2, ITV, Channel 4/5 SKY SPORTS and MOVIES and lots more with 46 inch flat screen TV, plus music system (radio/CD /USB stick or MP3 player). Also TV in master bedroom, ample loungers & patio dining furniture. Immerse yourself in your own warm water therapeutic 8 seater spa hot tub, combining an experience that is both rejuvenating and healing, whilst washing away muscle and joint pains with hydro massage water jets. A table tennis room is just off the pool terrace and an American pool table is on terrace for guest use. Furnished and maintained to a very high standard. Complimentary welcome pack provided on arrival. We stayed as a family and I must admit the pictures doesn’t do this place justice! Really spacious and everything plus more that you could ask for! Opposite a busy garage but you can’t hear anything. Situated in Tías where it’s around €6.50 to get a taxi into Puerto Del Carmen. Lovely views and quiet. Small walk across the road to garage to get basic things but a short 5 minute walk uphill into the Tías town where’s there’s a supermarket. Overall we couldn’t fault the villa but if you’re looking to venture into the main town of Puerto del carmen then like I said it’s around €6.50 each way. The villa was lovely and catered for all our needs. There is a shop in the garage across the road which sells newspapers, bread, milk etc so really handy. If you go left when you leave the villa and walk right up hill there are a number of shops, restaurants and a supermarket. There is also a medical center which you can access with your E111 health card, which we had to use and the service is excellent. A taxi into Carmen is about 10 euros, where again there are a number of bars and restaurants. It is also only about 10-15 mins in a taxi from the airport. We would highly recommend this villa. Thank you for a great review. Look forward to welcoming you back to one of our Lanzarote villas in the future. Great facilities in this villa - in particular the heated pool and hot tub, which were both available instantaneously (unlike other places we have stayed in the Canary Islands). It was exactly what we wanted for a relaxing Winter break. Highly recommended. Great property with everything that you need in a perfect location. The property was very well maintained and clean. It was very spacious and caters for children. The location was ideal as it was a very short taxi from the airport. Tías is beautiful and has some excellent places to eat. We are already planning on returning next year. Just a short walk from the Villa is the village centre where you will find supermarkets, shops, good restaurants, tapas bars, local bakery (for freshly baked bread and warm croissants), and a taxi rank. Villa Del Sueno is also just a five-minute drive from the spectacular 5km of golden beaches at Puerto Del Carmen with its palm tree's and rocky divides. The picturesque old fishing port is a favourite spot to watch late night boules or sample one of the many excellent seafood restaurants for that special evening. Alternatively visit our fabulous Marina at Puerto Calero and gaze into the clear waters to see the many species of fish, book a submarine or catamaran trip, or take a snorkelling lesson. Why not lunch or dine in one of the many quayside restaurants. Tias is centrally situated on the Island and is ideally placed for the many excursions: Timanfaya National Park (live volcano), Camel rides, Jameos del Agua (caves),Green caves, Cactus park and Parrot park, to name but a few. Golf: There is a new golf course just on the outskirts of Puerto del Carmen which is a 2 minutes away by car. There is also another course in Costa Teguise about a 15 minute drive away. Tariff: Rates are for up to four persons staying in the villa. There is a charge of £120.00 for every extra person per week. Bookings are from 14.00 hrs. on arrival day until 10.00 hrs. on day of departure (we can sometimes be flexible depending on incoming or outgoing guests). A £300.00 per week deposit is payable on confirmation of bookings. Infants under 2 are £35.00 per child. per week.